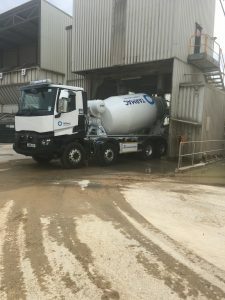 Martin Gibbons operates two concrete mixers on a franchise scheme for Tarmac. We deliver ready mixed concrete to construction sites at various locations. Currently we operate from Reading plant, however depending on workload and customer demand we can operate all over the country as required. FORS has helped me be a more compliant operator and in doing this we have seen a notable difference in fuel consumption, and thus improvements NOx emissions and the benefits cleaner air brings. Tarmac approached its hauliers about FORS in 2013 and in January 2014 we achieved Bronze. Initially it was something which we felt we had to do, as Tarmac had made it compulsory for its hauliers, however as time progressed, the benefits became apparent. Without FORS we would probably not have completed the cycle safe CPC module. Through progression, FORS has helped the company to be a more competent operator. After the initial audit we had to review some of the practices we used to ensure there was more detail, this was around driver training and collating information better. This helped the company understand that there were things weI could do better and that FORS was not just a tick box exercise. During following audits there was a lot of experience sharing, allowing me to keep the good practices we were already doing as well as allowing the company use better systems to ensure a better operation. After getting Bronze the company was unsure that a small organisation would be able to achieve Silver so initially it was the focus to maintain Bronze. At that point we were a single truck operation and it was only after the decision to upgrade and increase the fleet to two trucks did we look into progression. We did avail of the E learning modules and the CPC course on cycle safety, and the plan for the coming year is to take advantage of the Fleet Management Essentials course and attend as many FORS practitioner courses as possible. As a FORS member the weekly newsletter is a fantastic help. Probably the biggest benefit of FORS has been the focus we have had to give to cycle safety and fuel consumption. Focussing on these areas especially during the silver application really changed mind-sets on how the business should be ran. As a result when completing the Silver application, we had just taken on a new employee, who when assessing his training needs identified that the cycle safety course would be a huge benefit to him and the business. He attended this within 8 weeks of appointment and that has helped ensure my commitment to operating a better business. The fuel focus and the subsequent improvements have helped me both be a greener efficient operator but also financially it has saved money, a key focus point was unnecessary idling. Having the FORS logo on my truck is a clear demonstration to both the general public and customers that we take our business seriously and that through progression everyone can see that we have achieved a set standard, and as we hope to progress to Gold this will set my business apart from those who have not achieved that standard. Martin Gibbons takes road safety very seriously. Gary O’Neill Bishops Mechanical Services. The main reason for progression was that we wanted to demonstrate to Tarmac who we are a subcontractor for that we are capable of meeting the challenges ahead and that my business is one where Tarmac would like to continue in partnership with. FORS is also hugely recognised by the construction sector and certainly by some of the country’s main contractors. It is important that we continue to improve the operation and by doing this we are in a better position to benefit from more work and possible continued expansion in the future. Performance data – Latest data shows an improvement of 5.2% in fuel which has saved the company nearly £2000. Also an equivalent to 2800 carbon dioxide fire extinguishers worth of carbon dioxide in emmissions. Driver health and fitness review – We have formulated a performance review document which as part of the review process looks at when medicals are due, also during the performance review I talk to the driver about general health. Some sites/projects require a medical. One such is London Heathrow Airport and my latest medical is attached to G5 section of Gold application. We have raised Mental Health and Wellbeing as an issue to Tarmac during a safety week in Jun 17. Strategy for recruiting drivers – As a small operator we have not formulated a set strategy for recruiting drivers, however we are aware of the driver shortage issue. We have contemplated an apprentice but this is not financially viable at present. . The future in the haulage and construction is unclear, to this end we have to ensure that we are best prepared to meet the challenges ahead. Having purchased two Euro VI vehicles in 2016 we are focussing on better performance, continued compliance and better training and communication. Longer term and subject to viability the need will come to renew vehicles and to this end there will be big decisions to make. Direct vision is one of the ready mixed concrete industry’s’ requirements for London to meet the mayors targets. Constantly keeping up with what manufacturers develop will help put me in the best position when decisions will have to be taken. Hopefully on award of Gold my personal goal is to improve myself by attending as many courses as possible that will help me be better at my job. Through our FORS progression we have understood the need to continue to develop as so much changes, whether it be legislation or industry standards. By doing that we are confident we can maintain the standards and continue to fly the flag for FORS. Gold is a major step for my company, it shows that I’m able to demonstrate that the company is meeting the required standards, having Gold FORS logos on my trucks would be an illustration of my achievement but also be a great advertisement for FORS as working on some of the country’s’ biggest infrastructure projects would show the benefit of achieving FORS accreditation.